Eating at Christmas is so much more fun than other times of the year. That is when all the special recipes come out for yummy treats. 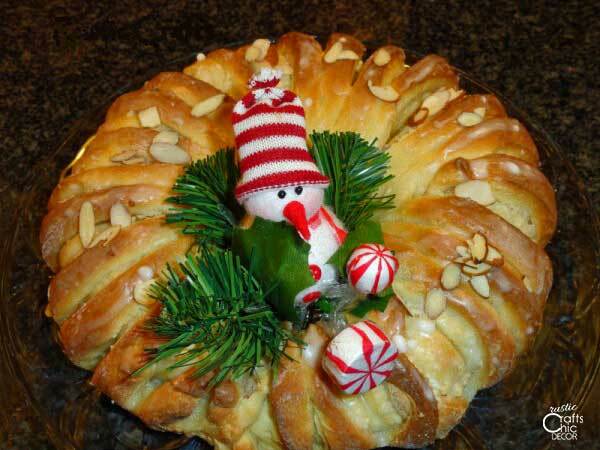 This Christmas wreath bread is one of my favorites. It’s a yeast bread ring that is packed with almond flavoring. Not only does it taste delicious, but it is so pretty shaped in a wreath ring. Our family loves to get up early Christmas morning to open gifts. Before starting with our main Christmas morning breakfast, we like to start out with a little treat to have with our coffee or hot chocolate. I started making this festive Christmas wreath bread several years ago as one of our morning pastry choices. It is one of my husband and my favorites. This bread is not hard to make but it is a little time consuming. However, it is great to make while you have other baking projects going on. I usually dedicate a whole day to making cookies and bread and that way there isn’t any wasted time while waiting for bread dough to rise. In a mixing bowl, combine 2 cups flour and one package of the yeast. Heat together the milk, butter, sugar and salt until just warm and butter is melted, stirring constantly. Add this mixture to the mixing bowl and add the egg. Beat at low speed for 30 seconds, scraping sides of bowl then beat for three minutes at high speed. By hand, stir in the 1 1/4 cups of flour to make a soft dough. Knead this on a floured surface until smooth (about three to five minutes). Shape into a ball. Place in a greased bowl, turn once, and cover. Let rise in a warm place until double in size (about one hour). Punch down. Cover and let rest for about ten minutes. Roll the dough out to an 18 x 12 inch rectangle. Spread with almond filling. Starting at long end, roll as for jelly roll and seal edge. Place seam side down and shape into a ring on a large greased baking sheet. Cut bread every 1/2 inch to within 1/2 inch of bottom. Pull slices alternately to the left and right. Let rise in a warm place until double (about 45 minutes). Bake at 375 degrees for 20 to 25 minutes. Spread top with glaze and sprinkle with sliced almonds. Cream 1/3 cup sugar and two tablespoons butter. Stir in 1/4 cup ground almonds and 1/4 teaspoon almond extract. Mix about one cup of powdered sugar and enough water to make a thin glaze. Add a couple of drops of almond extract to taste. Do you have a favorite Christmas morning breakfast tradition? Check out more Christmas recipes at my post best Christmas recipes for crafting in the kitchen. I love round breads (like Easter egg bread) – first time hearing about an almond flavored one like this. Oh this reminds me of years past. It looks wonderful!thank you for sharing and for linking to Thursday Favorite Things blog Hop at Katherines Corner. Merry Christmas Hugs! Looks delicious! Oh, how I wish I wasn’t the only member of my family who likes almonds. sigh. Oh well, maybe I’ll just have to make this for myself sometime. It’s definitely good enough to eat all by yourself!